Let me get this straight. Someone or something takes a chunk out of a tree, it bleeds sap, an insect gets trapped in it, and the whole thing turns to amber after a few zillion years. Not hardly! Sap and resin are different things, and when an insect or other critter gets trapped in amber, it doesn't just hang out and turn into a fossil. I recommend reading "Sticky Situations" for some basics on amber. While amber has been fascinating for many years, whether for jewellery or curiosity's sake, it has been receiving a great deal of attention in recent years. An ant beetle showed no change after all those assumed Darwin years, the claim of bird wings in amber backfired, assertions of dinosaur feathers in amber are ridiculous, and more. Now there's a new discovery that baffles the evolutionary cult of death. This new item shows a tick, blood cells, and one-celled organisms that live in blood cells. That's pretty impressive technology right there! Special equipment shows that they were not just any blood cells, but those belonging to a mammal, which was probably a monkey. This is a problem for evolutionists, since amber is not a perfect preservative, so the tick as well as the blood cells (not to mention the organisms in the cells) could not have lasted for as long as the Darwin Party desire. Why didn't they break down long ago? Darwinian magic? Yet again, creatures preserved in amber help to refute not only evolution, but also long ages. Take away the circular reasoning and faith-based assertions of secularists, and evidence shows that Earth was created recently. Looking for the clearest amber on Earth? 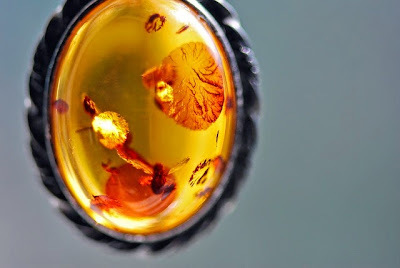 A new study shows that Dominican Republic amber is clear enough to see what's inside. Apparently, ancient parasitic protozoans loved to live inside intact red blood cells. Publishing in the Journal of Medical Entomology, renowned amber collector George Poinar showed over a dozen pictures taken with a microscope. They reveal tiny parasites in various growth stages inside blood cells as well as body tissues of a bloated tick trapped in the amber. Don't be ticked off. You can read the rest of this short article by clicking on "Amber-Encased Blood Cells Look Fresh". For additional information, I suggest you read "Tick Talk: Mammal Blood Found in Amber".